Peter Podbevšek was born on November 16, 1981 in Slovenj Gradec, Slovenia. While studying cation binding within G-quadruplex structures in 2009 he received his B.Sc. degree in biochemistry at the Faculty of chemistry and chemical technology, University of Ljubljana. He spent 4 months as a Marie Curie fellow at the University of southern Denmark, Odense working with short RNA hairpins. Afterwards he was involved in the “Young researcher” program at the NMR Center at the National institute of chemistry in Ljubljana under the supervision of Prof. Janez Plavec. In the year 2011 he was awarded his Ph.D. degree in biochemistry and molecular biology at the Faculty of Medicine, University of Ljubljana. His Ph.D. work was focused on the influence of chemical modifications and cations on 3D structures of oligonucleotides. As a postdoc he spent two years at the International School for Advances Studies, SISSA in Trieste, Italy. 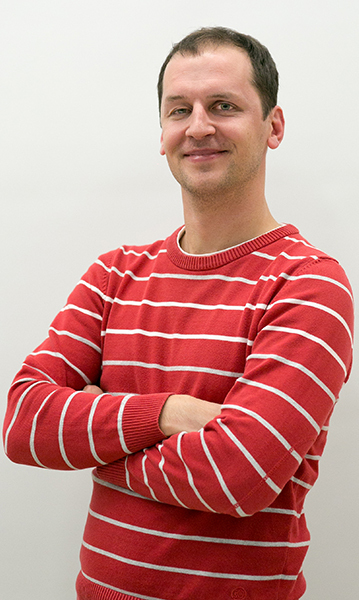 His postdoc project supervised by Prof. Stefano Gustincich was structural characterization of long noncoding RNAs. Dr. Podbevšek is a coauthor of 10 research papers. He is involved in the training of undergraduate students and organizes scientific meetings. Nucleic Acids Res. 2016, 44(2), 917-925. Web access at Oxford Journals. Nucleic Acids Res., 2010, 38 (20), 7298-7307. J. Amer. Chem. Soc. 2019, 141 (6), 2594-2603. J. Am. Chem Soc. 2018, 140 (17), 5774-5783. Sci. Rep. 2018, 8, article number: 3189. Nucleic Acids Res. 2017, 45(12), 7021-7030. J. Inorg. Biochem., 2017, 166, 190-198. Croat. Chem. Acta 2014, 87 (4), 321–325. J. Org. Chem. 2013, 78 (19), 9560-9570. J. Biomol. NMR 2013, 57 (1), 1-9. Biochemistry 2011, 50 (19), 4155-4161. Nucleic Acids Res. 2007, 35 (8), 2554-2563.